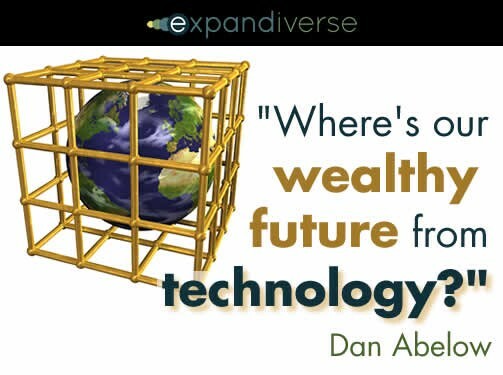 Where’s the wealthy future that we should receive from advanced technology? Advanced societies create most inventions, but they’re turning into barbells with their middle class pushed to the bottom while wealth is moved to the top. We’re overdue for solutions. If a generation is 25 years, then only 400 generations separate us from civilization’s birth, about 10,000 years ago. At just 400 generations, we are the biological brothers and sisters of the people who domesticated animals and plants. You feel your sweat drip from your chin as you work in your field under the late Summer sun, suddenly inhaling deeply as you enjoy the first faint tang of Fall’s cool air on the breeze. Your plants are nearly grown. This year will bring a change from hunting and gathering. There won’t be starvation during the cold winter months. It will soon be time to harvest, to celebrate. We took nearly all those 400 generations to reach the industrial revolution. In the past eight generations we transformed everything. Today’s farmer uses land management software, satellite images and soil samples to plan crops, predict yields and calculate farm equipment steering patterns. Drones micro-monitor fields and crops. Now you sit in the air conditioned cab of a 35-foot wide combine, confirming its GPS and laser-guided steering. Your combine’s automated steering replaces your sweat with with one-inch steering accuracy. 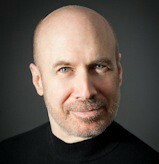 Music and talk radio replaces boredom. But that’s not enough. Automation continues to advance. The driver of tomorrow’s farm equipment and trucks will be a driver and a dog. The driver will be there to feed the dog, and the dog will be there to bite the driver if he touches anything. Today we stand on a mountain of human learning and transformation that has only taken us about eight generations to build. We began industrializing only a few generations ago. Our generation is about to leave behind our parents’ industrial revolution as we transform the world into a Digital Earth. The industrial revolution’s economic and national prosperity were powered by new inventions and scientific advances. These determined the people, companies, and countries who led the world — basically the world’s rich, middle-class and poor. New knowledge, science and technology became the new levers of power and wealth. At the “top” the middle class in advanced societies and economies, which are roughly 12% to 15% of the world’s population, face an economic plateau. Their societies’ inventions and technologies race ahead. Productivity is surging. Many corporations earn high or record profits. But middle class incomes are declining. Middle class jobs are vanishing. Low paying jobs are spreading quickly. Most college educated kids are under-employed. Government and thought leaders don’t have answers. In these “world-leading societies” science, invention and technology keep advancing. In fact, their pace is faster than ever. Where’s the great future that should be possible with today’s technology and abilities? The economic returns to most people are falling. Productivity, technology and wealth creation no longer fuel many kinds of jobs and earnings. Large numbers of people are well trained to thrive in yesterday’s industrial society, but that world is vanishing. The middle class in “advanced societies” are in an economic decline. More people are being shut out. When someone loses their middle class job and can’t replace it, they face a crashing nosedive. There’s an invisible elephant in the room: Has the tech industry failed society? Where’s the prosperous future that should be possible from the tech industry’s amazing innovations, products and services? The “advanced societies” are failing when compared to the converging societies and economies — the economies that have sped up. 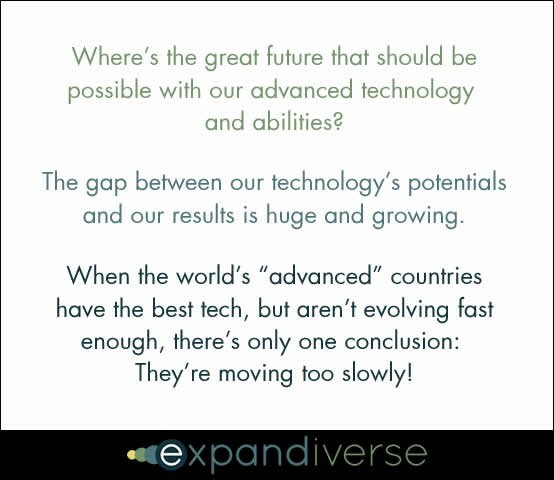 When the world’s most “advanced” countries have the newest and best tech, but they aren’t evolving fast enough, there’s only one conclusion: They’re moving too slowly! The gap between our technology’s potentials and our results is huge and growing. What if we could invent a more powerful Digital Earth where everyone can succeed and reach the top of society?